Today’s celebrated dish is a kidney-shaped seed that is sometimes referred to as “the world’s healthiest food.” November 22 is National Cashew Day! It’s also National Cranberry Relish Day, which would be great…if Thanksgiving weren’t next week. I love cranberry relish, but I don’t particularly feel like making it twice. I’ll wait ’til Turkey Day for that. Instead, we’re honoring the mighty cashew, one of many nuts we’ve paid homage to this year (see almonds, pistachios, pralines, pecans, macadamia nuts, hazelnuts, etc.). Cashews are actually the seed of the cashew apple, native to Brazil. They grow on the bottom of the fruit (which itself is considered a delicacy in Brazil and the Caribbean) and must be shelled before being sold because the interior of the shell contains a caustic resin used to make varnishes and insecticides. Not something you would want to ingest willingly! Cashews are nutritional powerhouses not only because they are shaped like boxing gloves, but also due to the fact that they contain less fat than most other nuts, and 75% of that is oleic acid, the same heart-healty monounsaturated fat found in olive oil. In fact, cashews have so many healthy antioxidants and vitamins, new studies show if you eat a handful a day you will start aging in reverse and will never die. OK, not really, but I bet that got your attention! Eating a handful a day of most nuts IS good for your health, and cashews are no exception. So indulge to your healthy heart’s content! We bought a can of cashews and each had a handful to snack on. 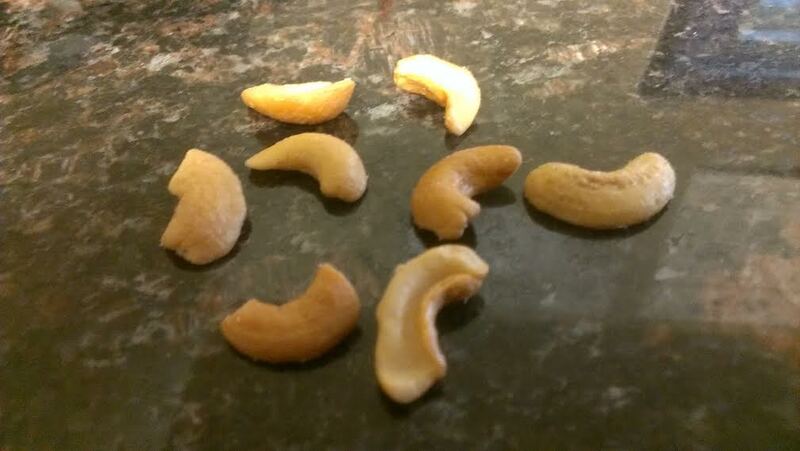 Good stuff…cashews are some of my favorite nuts!